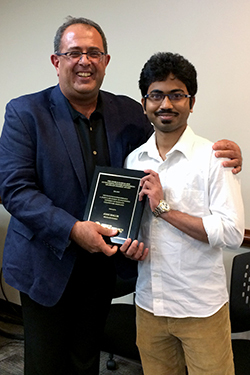 Ayan Mallik is the 2017 winner of ISR’s George Harhalakis Outstanding Systems Engineering Graduate Student Award. He is a student in Professor Alireza Khaligh’s (ECE/ISR) research group. Mallik’s research spans several areas of power engineering and energy systems for electric vehicles and “more electric” aircraft. This includes modeling, simulation, design and development of power electronics interfaces. He has both extensive knowledge in control systems and excellent hands-on experience. Khaligh says that this is vital for someone conducting power electronics research. Mallik is working on a challenging Boeing project to design a power supply for auxiliary loads in future more electric aircraft. Khaligh reports that he has done an impressive job designing a proof of concept prototype that has a 98 percent efficiency and unity power factor. He also is working with two other students to design an integrated onboard charger and converter for plug-in electric vehicles. Khaligh says that Mallik’s performance is comparable to an experienced postdoctoral researcher—he is leading this project and at the same time mentoring other graduate students.